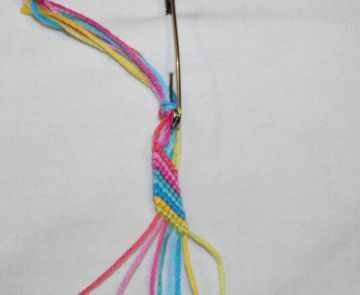 When I was a kid, one thing I remember doing was sitting and hand-making lovely little bracelets that we called Friendship bracelets. I used to love doing that so I thought it would be fun to revisit. They are really easy to make, don’t require any additional tools (like needles or hooks) and can be made almost anywhere! Heck, I remember my sister sitting in the back seat of the family car on long road trips, her floss pinned to the knee of her jeans, braiding & knotting away as we traveled. First step is to cut your floss. I always used to hold the floss in my left hand and measure it up to my shoulder (that’s how my mom taught me). But you can also measure the width of your wrist and multiple by 5 to get an appropriate length. This is going to seem really long but remember, you are braiding/weaving/knotting it so it will shorten the finished product. If you are using different colors for patterns, cut one stand with measure and then you can use that as a ruler for the other strands/colors! 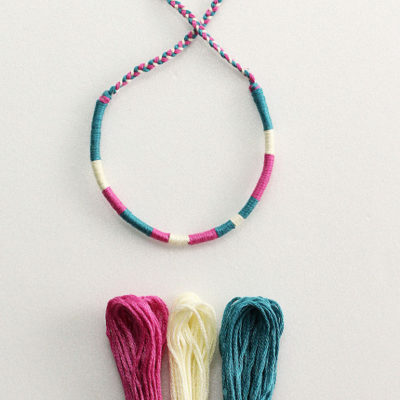 Let’s just focus this post on easiest, basic beginner so we will only do six strands of floss and only three colors in one bracelet. Once your floss is cut, you will lay all three colors together and tie a knot into one end. Then adhere it to a table top or your pant leg or a pillow. Braid a simple braid three inches down (you will be doing this at the end of the bracelet too). After you have your 3 inches of braid, knot under the braid again. Now to the detailed part of our bracelet! Choose what order you want your colors to go in. Example: I’m using yellow, green, pink, blue, orange and purple in that order. Arrange your floss in the order you want from left to right. The first row will be the farthest left-hand color. 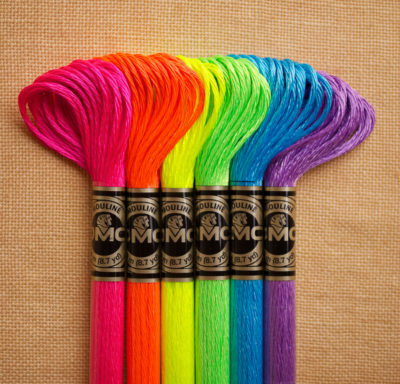 So my first row will be yellow, followed by green, then pink, then blue, then orange, and finally purple. Take the first two strands (yellow and green) and pass the first strand OVER the second, then behind the same strand. 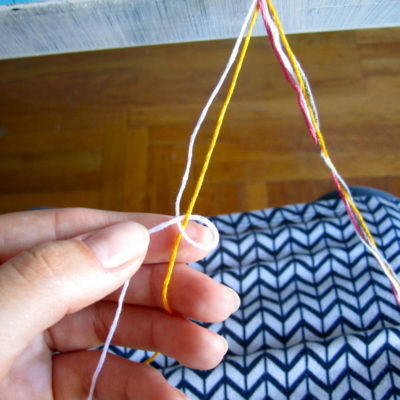 Basically, you are knotting your first color around the second strand. Pull this up toward the top knot gently to tighten it. Don’t pull it super tight, just pull it up lightly so that it is knotted around the strand snug. Do this a second time on the same strand (there should be TWO knots on each strand). Follow these same steps for the rest of the row. So same snug knot of yellow around the pink strand, then the blue strand, then the orange strand, then the purple strand. You will now have a row of yellow bumps across the top of your bracelet. Start again at the left (this would now be my green strand) and do exact same steps across the row. Continue doing this until you have 3-4 inches of knotting done. Once you have the amount of rows you need (roughly 3-4 inches worth), gather all the strands together and make a large knot (like we did at the very start). Then simply braid three more inches, knot again and snip excess floss from ends. Voila! Friendship Bracelet Achievement Unlocked!